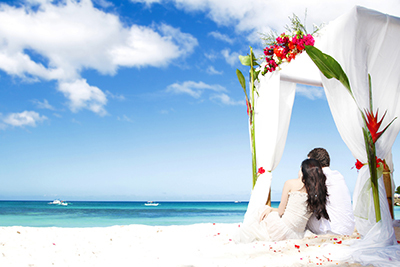 It’s wedding season and Jamaica’s shores are the perfect place for a destination wedding fit for a queen. From absolute five star luxury and laid back beaches to gorgeous sunsets and mountaintop backdrops, you’ll find a distinctive wedding experience awaiting you here, on the ‘Jewel of the Caribbean”. For the sophisticated couple, saying their “I do”s against the backdrop of the world famous Negril sunset on the bridge over the beautiful Caribbean Sea at Rockhouse, provides the type of photo ops made for magazine spreads. The Round Hill Resort and Villas or the sprawling Trident Hotel take it up a level, offering the same stellar service to all their guests, including major celebrities. The Bohemian bride will find her dream barefoot wedding just a stone’s throw away along Negril’s seven mile beach with her own personal musician for hire in nature’s cathedral. The Caves Hotel with its charming Cliffside colourful setting and underground caverns will provide you with a unique island wedding and honeymoon experience. If it’s adventure you seek, then say your vows while riding the Skylift 700ft above ground at Mystic Mountain or on the edge of the cliff at Lover’s Leap. Couples have headed for nuptial bliss at full speed and with all abandon while riding ATVs through the backtrails of Jamaica or off the beaten path horseback riding in the blue waters of the Caribbean Sea. The South Coast of Jamaica boasts several villas and guesthouses that create the perfect setting for a dream wedding with most offering fantastic budget packages that include the wedding and bridal party, including tours to some of the country’s most popular excursions and fun activities. Better yet, skip the crowds at Dunn’s River Falls in exchange for the awe-inspiring YS Falls or take your wedding party by boat to Pelican’s Bar for an after-vow beer. The perfect Caribbean destination wedding is never more than a call away to your travel agent or checking in with the wedding services coordinator at your hotel, who will help you turn your idea of your dream wedding into a reality.